Has anyone felt like it’s been Halloween season for like a month already? Every store I go to has had it’s Halloween decor out for ages, even so much so that they’ve started putting out Christmas decor. WHAT. I can’t handle it. I can’t shop for tree ornaments 3 weeks before I’ve bought Halloween candy. At least now it’s actually October, so I can handle the spooky decorations and orange everything starting to ramp up. My kids are still quite young so we don’t do a ton of decorating for holidays (also because I can’t be bothered!) However, I do like to change out the artwork in my gallery walls to make them seasonal. 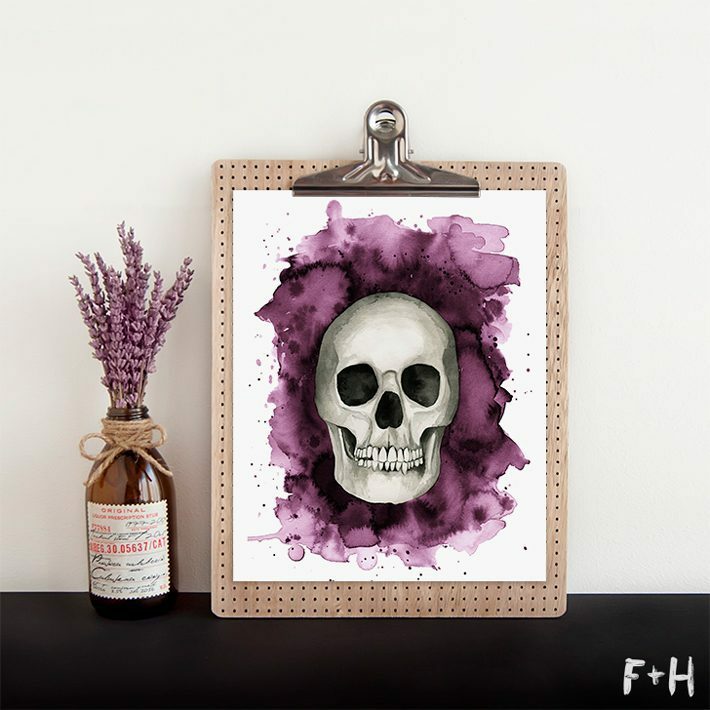 I like a little bit of spook with a little bit of lovely, so I painted this sweet watercolor skull print to capture both. I’ve made it into a free printable for you guys too so you can add to your walls! These prints are for Personal Use Only. Copyright lays with Fox + Hazel and is not to be re-sold. Please do not distribute these files via email or blog. Instead, link back to this post. 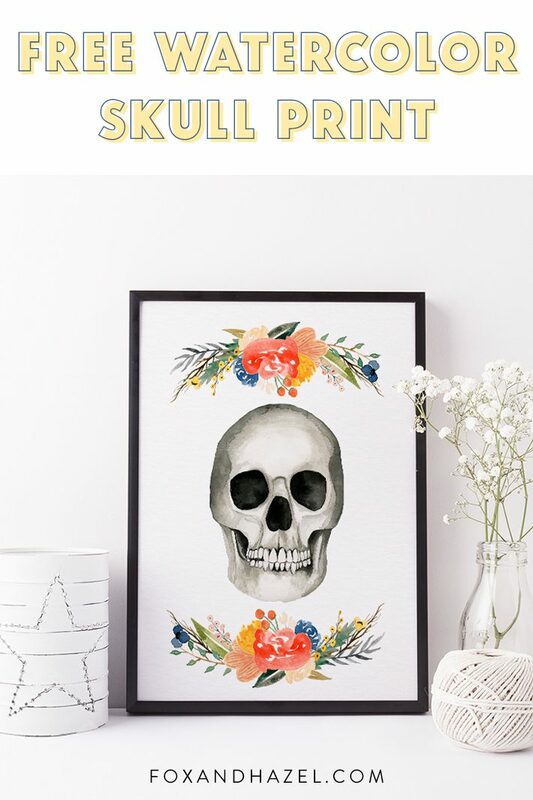 If you loved this free print, you can say thanks in one of these ways! 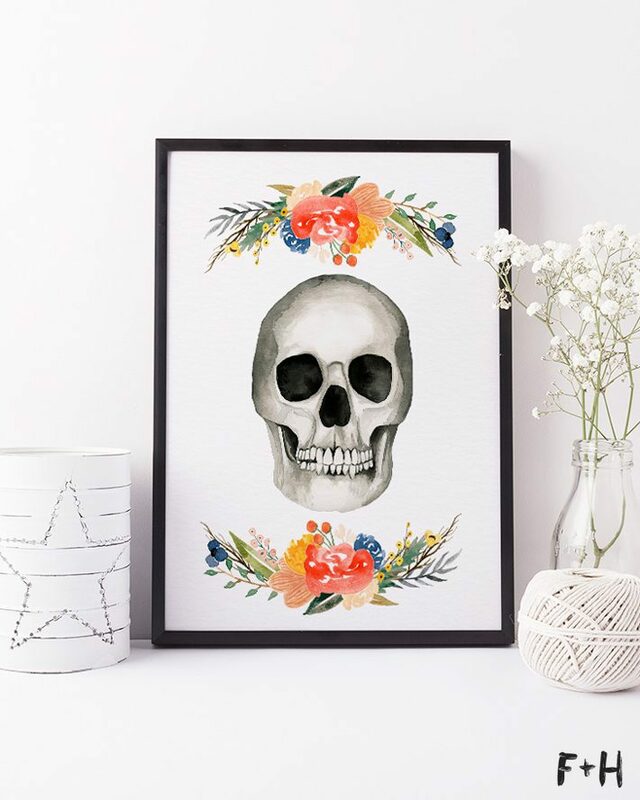 And if you’re looking for something just a liiiiiiiittle bit spookier, you can find three more watercolor skull prints over at Dawn Nicole Designs™ to get your house ready for Halloween! Just click on the image below to head over and get them! I would love to see these prints in action, so please share on Instagram and tag me! It’s always a kick to see my printables in the homes of people. Also, show me your Halloween decor so I can get some ideas – I’m the worst at decorating for anything but Christmas! Share your decor, teach me your ways. I’ll love you forever.